Here's a super stupid question that maybe I could just put to my local bike shop as I'm sure they'll have the answer - had a flat couple months ago and changed out the tires since but the old set of tires (not tubes) is still good and actually I think I prefer them (they are Specialized Espoirs 30s vs the All Conditions 28s which I'm rolling now). As we took off the wheel and tire we saw that there were a few cuts through the outer tire - like 3-4 small perforations - presumably from missing something and running over it. Tube was changed out but I'm wondering if there is something like a metalized tape or the like that can be put onto the inside of the tire to help make sure another something is less likely to hit one of those holes (unlikely as it is). Suppose that duct tape might do the job but I was wondering if there wasn't something that was a little more penetration resistant that people sometimes use. Armadillos in 28c are 80 grams lighter than the Espoirs in 30c, each. Both have built in flat protection and both have an abysmal 60tpi casing. Turbo Cottons have 320tpi and roll even nicer, are lighter by 40g and have flat protection...30 dollar price premium over ordinary Armadillos. I'm rolling the Conti GP 4-Seasons in 28c, at 330tpi. way nicer than the 60tpi Espoirs that I started with and very nice on reasonable dirt roads. Oldschool, when I used to tour, I carried an oval cut out from a tubular sidewall. Inner tube pressure is enough to keep it stable. A dollar bill or a cut down dollar bill will also work due to the high linen content. So long as the tire isn't deforming under pressure you can squeeze out a lot of miles out of a tire with a minor cut. Just went for a "quick lunch ride" with a group from my office. All of them were late 20's to early 30's...I think it may have been a mistake. We did just over 20 miles in just under an hour and it was all I could do to keep up, even while hanging out in the middle of the group catching a big fat draft. There is no doubt in my mind that my body is going to punish me for this little bout of stupidity. A couple Saturdays ago 5 of us did I really nice ride in the Greens. It was the Saturday after Labor Day and was unseasonably cold. The day time high might have hit hit 60f, and it was much cooler on top of the gaps. Ernie, TS01 and I pedaled south on rt 100 from Warren Falls. We met Mike and Rich en route down in Hancock. From there we continued south to Rochester and then over the Brandon Gap. We rode north along Lake Dunmore and crossed back over the Greens on the Middlebury Gap. As luck would have it, there was delicious beer awaiting in my car at Warren Falls on the return. Beer and an icy cold swim after 73 miles in the saddle are wonderful things. Rich & Mike topping out on the Brandon Gap. 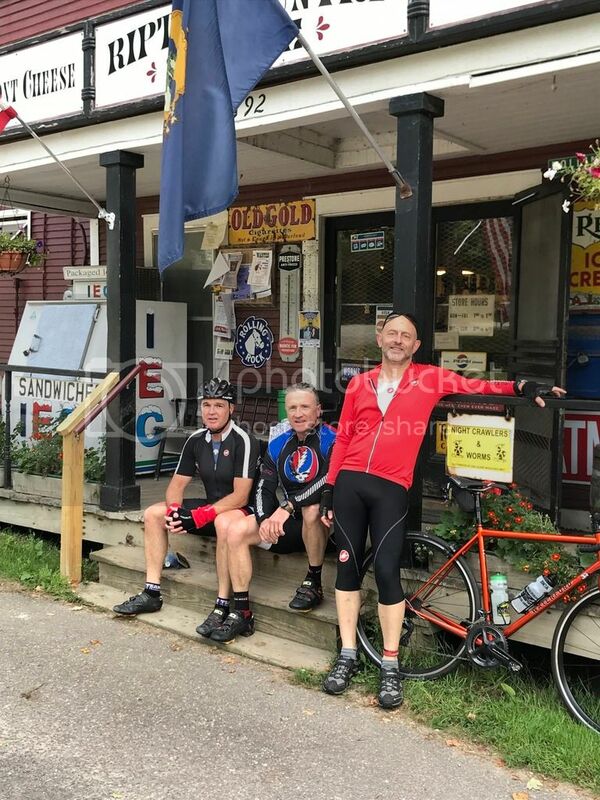 Rich, me & TS01 at the Ripton Country store. It's an iconic spot on the west side of the Middlebury Gap. Catching a breath high on the Middlebury Gap. Nice! That's a tough enough loop without the pain of a final climb up through Granville Gulf when you're already pooped. 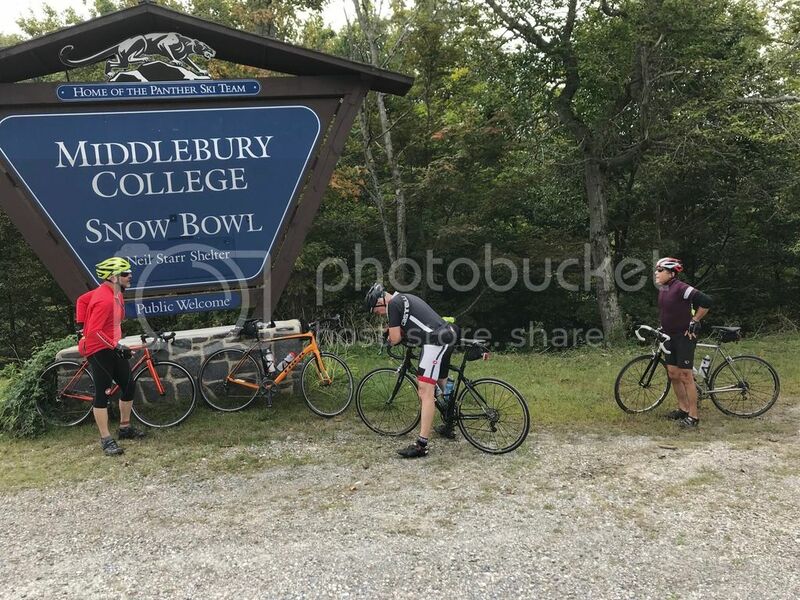 I rode the Kelly Brush ride out of Middlebury a couple of weekends ago. No gaps but beautiful scenery. Highly recommended if you are ever looking for a fall century. 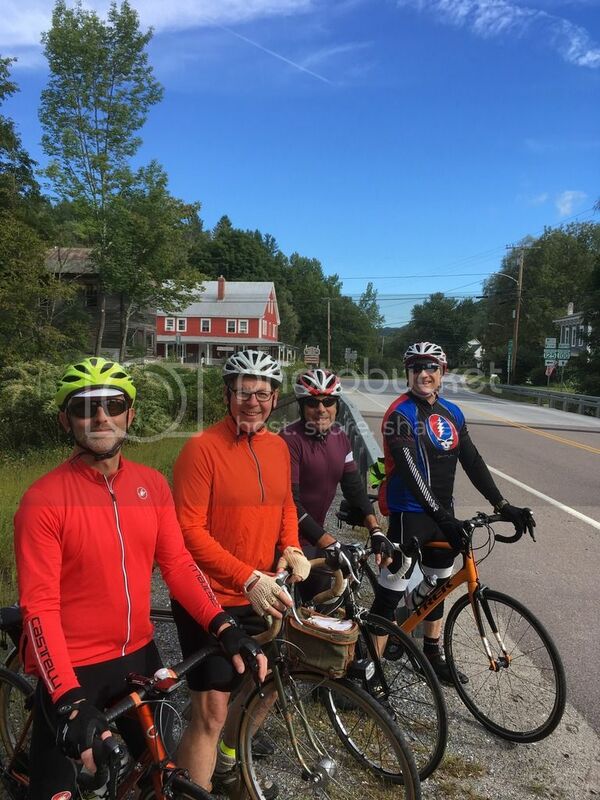 Williamtele wrote: I rode the Kelly Brush ride out of Middlebury a couple of weekends ago. No gaps but beautiful scenery. Highly recommended if you are ever looking for a fall century. I think the KB ride was the same day as our ride. There were road bike laden cars coming and going from Middlebury all day. It sounds like a great event. Interesting mix of gear on that ride, Benny, from full-on bar-end retro to carbon fiber. That Waterford is a beautiful frame. But in the end, I bet everyone is sucking wind in equal amounts at the top of the climb. Dirk wrote: Interesting mix of gear on that ride, Benny, from full-on bar-end retro to carbon fiber. That Waterford is a beautiful frame. But in the end, I bet everyone is sucking wind in equal amounts at the top of the climb. Ted's Waterford is real eye candy. It's hard to see, but the gent in the maroon jersey's on a titanium Guru, also a gem. And then there's Mike on his 40lb Rivendell..... Despite the weight of that rig and how few miles he's ridden this year, somehow he's all smiles on these huge hills. I've been trying to decide whether the east side or west side of Middlebury is more painful. The jury's out, though the initial 15% climb as you start up the west side from town is a hell of a way to begin an 8 mile ascent. 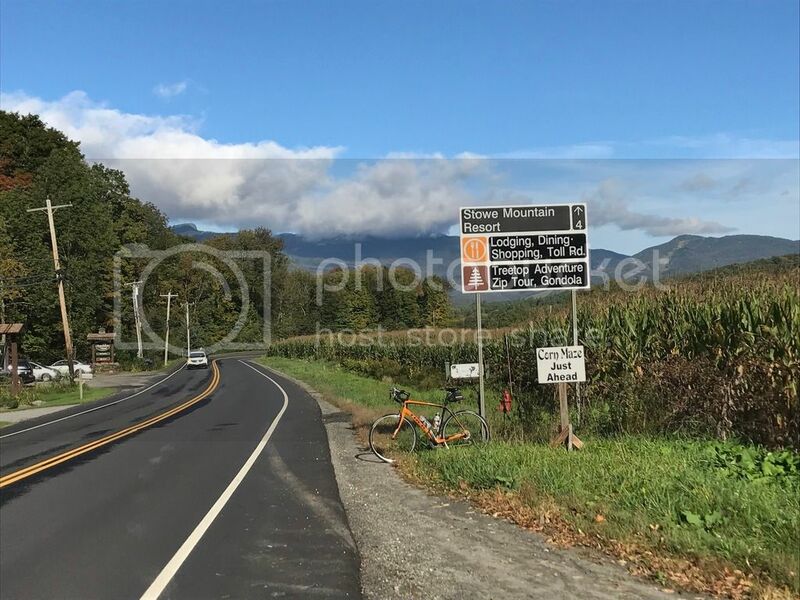 If case you haven't been on it in the last year, I highly recommend pedaling up the east side of the Brandon Gap from rt 100. The pavement is perfect, the climb very gradual (relatively speaking) and scenic and that road gets very little car traffic. Even riding up and back down the same way back to Rochester would be a nice ride in itself. A couple Thursday's back the forecast was too gad to pass up, so I played hooky. 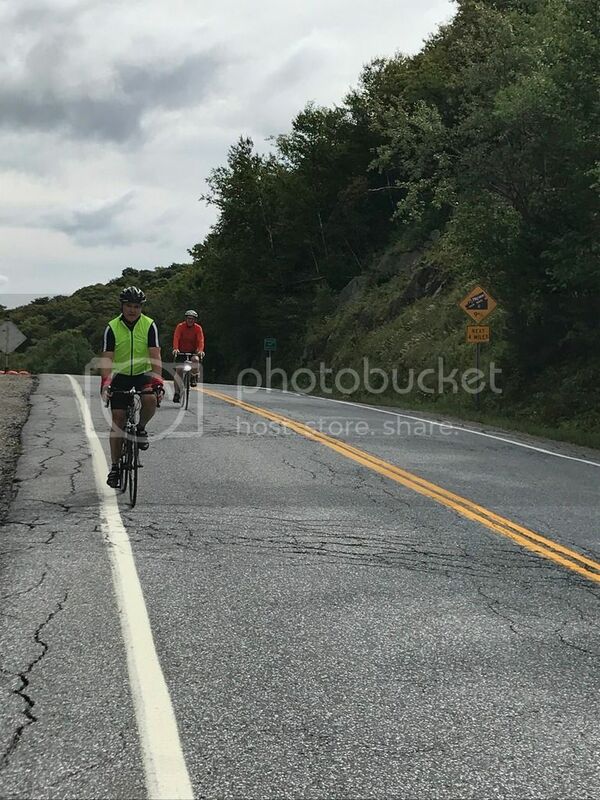 I had a chance to pedal over Smuggler's Notch during a low traffic time. It was a beautiful ride. Looking west from Stowe on Mountain Rd. This shot should include Spruce peak in the upper right corner. For some reason if the web browser isn't maximized this picture gets truncated.